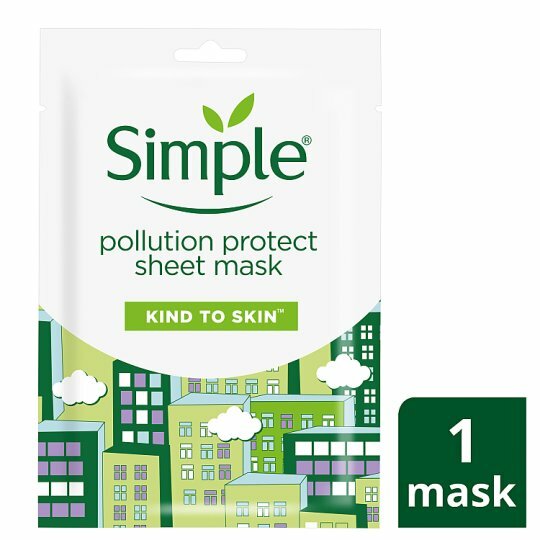 Our Simple® Pollution Protect Sheet Face Mask is the perfect antidote to pollution. So light and soft that it contours the face like a second skin, and inspired by Asian beauty rituals, our Korean sheet mask infuses active nutrients into the skin to minimise the drying effect of pollution and instantly hydrate your skin. Enriched with antioxidants Vitamin E, Vitamin B3 and Agave Americana, it does not contain unnecessary ingredients like perfumes, fragrances and harsh chemicals that could lead to skin irritation. Instead, it contains the perfect-blend of skin-loving ingredients that are gentle and kind to skin, making it perfect for all skin types, even sensitive skin. Feel the benefits of a detoxing facial treatment, in one convenient, easy-to-use sheet mask. How to use? Remove the mask from the sachet and gently unfold. Place the mask evenly over your previously cleansed skin. Leave for 15 minutes and gently peel off the mask. Massage the excess of product into your skin or use a cotton pad to remove, depending on how hydrated you want your skin to be! No need to rinse. No artificial perfume or colour. No harsh chemicals that can upset your skin. Warning: For external use only. Avoid getting into your eyes.